Anyone that has been around children for any amount of time knows that all children have at least one thing in common – all kids like to mimic grownups! Whether it’s their mom and dad, grandma and grandpa, or just someone they admire, if you do it…they do it! There are few things in a christian’s life that can identify them with Christ as well as a christian that forgives. Probably one of the hardest things that we as Christians are expected to do at times it to freely forgive those that have done us wrong. Lucky for us, this is an area of the Christian life that God has told us: “Follow Me”. Ephesians 4:32 reads “And be ye kind one to another, tenderhearted, forgiving one another, even as God for Christ’s sake hath forgiven you.” Did you catch that? In the very same verse that God commands His children to forgive, he remind us of the perfect example of forgiveness – Christ! 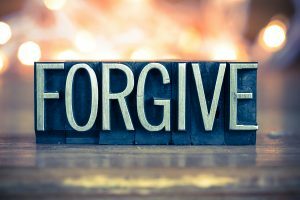 If we as Christians are to forgive even as God has forgiven us we must ask the question – how did Christ forgive us? Have you ever thought to yourself, ‘That person did me wrong, but if they are willing to say they are sorry for what they did I will be happy to forgive them’? You see, that is the world’s way of thinking! The world says, once someone is sorry the right thing to do is to forgive them. My, what a sorry state we would be in if God waited for us to be sorry for our sin before he offered forgiveness! 1 John 1:9 was written to Christians to say that no matter what sins we allow into our lives, God is always willing and ready to forgive His children. When you accepted Christ as your Saviour, God welcomed you with open arms and forgave you of your sins fully knowing that you would fall and sin again – But that did not stop God from forgiving you! What a wonderful God we serve! There are times in life when people that are closest to you do things to hurt you the most. It is in these times that we must practice Biblical forgiveness. For if we truly are going to take on the image of Christ we must follow His example and forgive as God forgave us!